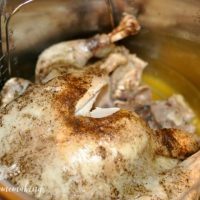 Instant Pot Whole Chicken is a super easy-to-make staple at our house! Here’s how to roast a whole chicken in your pressure cooker. This post includes affiliate links. Read my disclosure here. The Instant Pot was one of those appliances that took me by surprise. As I’ve mentioned before, it took me awhile to warm up to the idea of another gadget in my small kitchen. When my mom asked me if I would be interested in having one (as a Christmas gift), I had to admit that I hadn’t ever given it much thought. I didn’t even really know what it was! After doing some research, I decided that, yes, I’d love to have one. And now I’m so thankful for it! It’s so useful! 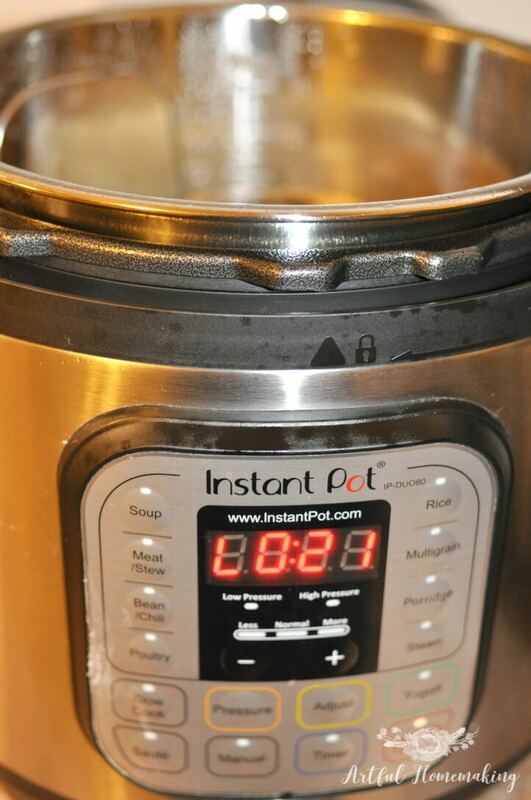 The Instant Pot has changed the way I cook, and it’s made everything so much more convenient. I still use my slow cooker quite a bit, but I find that I’m using it less and less these days, as I prefer the Instant Pot. One of the first things I made in my Instant Pot was a roasted whole chicken. This photo doesn’t really do it justice (it was the best I could get before we sat down to eat! ), but trust me, Instant Pot roast chicken is moist and delicious! I have the 8 quart Instant Pot (this one) and I love how big it is! It’s perfect for our larger family of seven. I can fit a pretty large chicken in mine. The chicken in this photo was almost 6 pounds, and I cooked it for 36 minutes. You can figure out the right cooking time for your particular chicken by multiplying the number of pounds by 6 minutes. For every half pound add 3 minutes to the total cooking time. The time it takes depends on lots of different factors (I’ve heard elevation can make a difference in cooking times), so it may take some trial and error to get it just right. I always use a meat thermometer to make sure it’s done. This Instant Pot Whole Chicken recipe is simple to make. You can use it for a main dish or you can also just de-bone the completed chicken and store the meat in smaller portions in the freezer. Don’t forget to save the carcass for making bone broth later! 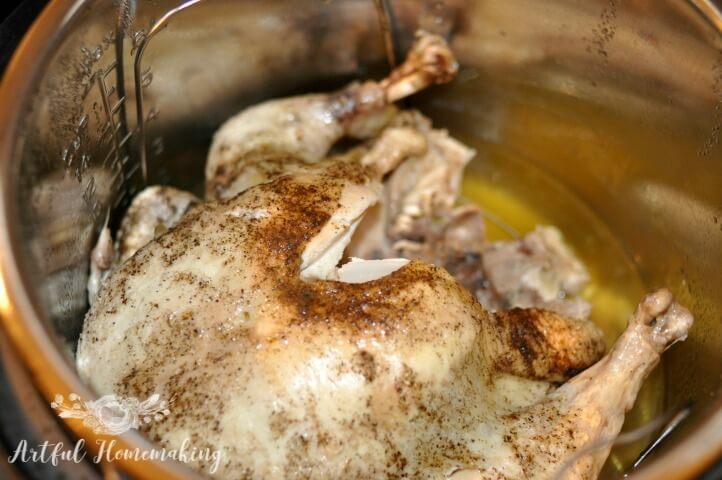 Roasting a whole chicken in the pressure cooker couldn't be easier with this basic recipe! 1 whole chicken 3-6 lbs. Remove giblets, neck, and anything else in the chicken cavity. Select the sauté setting on the Instant Pot and add 1 Tablespoon of oil to the pot. Allow it to preheat for a minute or two. Sprinkle the breast side of the chicken with half of the seasonings. After the oil has heated, place the chicken breast-side down in the pot. Let it brown for a minute or two. While it's browning, sprinkle the rest of the seasonings on the back side of the chicken. Using tongs, turn the chicken over and let it brown the back side. This will only take a few minutes total (for both front and back). Add 1/2 cup water to the pot. Place the lid on the Instant Pot and lock it in place. Turn the vent to "sealing." Select the "poultry" setting and increase the pressure to high (use the "adjust" button for this). Or, you can also just use the "manual" button and select the amount of time needed for the size of your chicken. Use the chart below to determine the cooking time. A general rule of thumb is 6 minutes per pound. After the cooking cycle ends, allow the pressure to naturally release for 15-20 minutes. This will result in moister meat. After 15-20 minutes, do a quick release and then open the lid. I recommend using a meat thermometer to make sure the chicken is done. Allow the chicken to rest for 5 minutes and then serve. 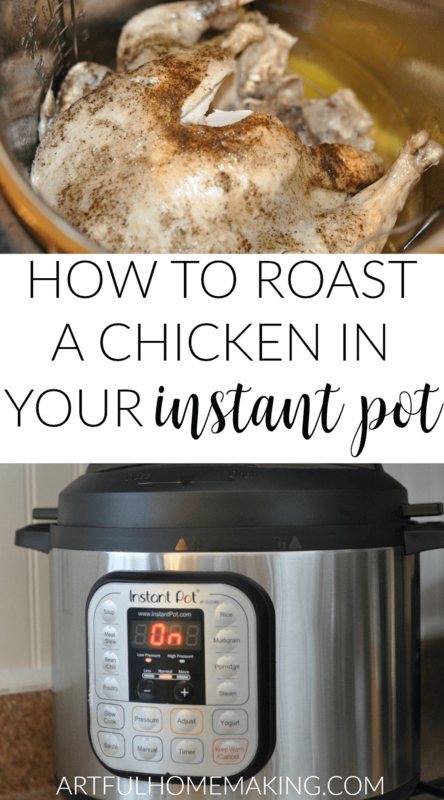 After years of cooking a whole chicken in the slow cooker and the oven, I now prefer to use the Instant Pot to cook my chicken! Okay. I have an Instant Pot, and I’ve never used it for ANYTHING! I’ve been wanting to figure out how to use it, so I need some recipes like this one–simple, easy-to-follow, not too complicated, but useful! It took me awhile to get into using mine, too—for some reason I was scared of it! 🙂 But once I got started, now I use it all the time. It’s such a handy tool to have! Thank you so much for this!! I do not have an InstaPot but have heard amazing things. And a whole chicken in 36 min! That is my kind of meal!!! I will definitely be looking into this a little more! Thanks for linking up @LiveLifeWell!!! You’re welcome, Amy! It’s now one of my favorite kitchen tools, and it makes such moist chicken! Thanks for stopping by!